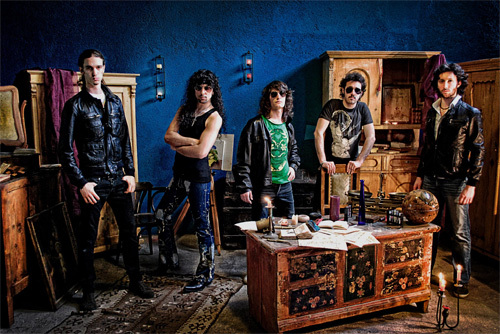 Alchemy is a promising band from Brescia in northern Italy band. They've been honing their craft for several years now, almost ten, performing live and releasing two EPs in 2013 and 2015. They arrive with their debut long player Never Too Late. If you could read between the lines, you'll notice that I did not call this album "new." At least four of the songs here are from the 2013 EP Rise Again. So I'm guessing the remaining four are from 2015's D.A.R.E.D, but that is unconfirmed. Nevertheless, Alchemy could best be described a melodic heavy metal band with a strong hard rock groove, and straight out of early to mid Eighties. Then with a twist or two. With a song like Alcohol Symphony, there's a bit of the sleaze metal factor. With Blessed Path, the add a strong symphonic texture to a soaring metal anthem. 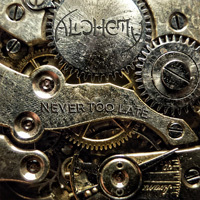 After these things, Alchemy is characterized by strong riffs, roaring solos, a rhythm section which allows the bass line to rise, and clean, yet bit forceful, melodic vocals. It took me awhile to hear it, but Marcello Spera has a slight timbre of Geddy Lee in his voice. Finally, Alchemy is skilled at putting their arrangements in an AOR wrapper thanks to the combination of groove, melody, and catchy refrains. Fundamentally then, for fans of melodic hard rock and heavy metal, I think you'll find Alchemy and Never Too Late to be a strong effort, good listen, and the promise of even more to come. Recommended. For fans of melodic hard rock and heavy metal, I think you'll find Alchemy and Never To Late to be a strong effort, good listen, and the promise of even more to come. Recommended.